Did you know you can now order your Deliveroo takeaway from Octoberfest Pub here on View? "The Octoberfest Pub provides London with Oktoberfest all year round, join in the fun! Designed to emulate a Munich beer hall, our venue features long wooden tables and benches, Bavarian style decor, with colourful flags, Oktoberfest memorabilia on the walls and ceilings. The staff are in authentic dirndl and lederhosen as they serve up beers by the litre and fantastic food. If your event wants to capture the spirt of Oktoberfest and Bavaria even before the party begins then we are the place to book your next event. We cater to everything from corporate functions to birthday parties and everything in between, our slice of beerhall heaven appeals to everyone. Our Live German Oompah band "Oompah Brass" really put on a show and standing on your chair is actually encouraged!!!! So, come down and have a stein, a pork knuckle and join in the fun!!!" The largest list of German beers in the UK including wheat beers, dunkles, mazners and pilsners. Must pre-book for Fri-Sat night Oktoberfest shows. What did you think of Octoberfest Pub? I am a great fan of The Fest, a great great fan! This has more to do with the lovely ladies who always have beer in their arms than the actual venue but they must be doing something right, 50% of my wages seems to go in the Fest, what can I say, I get mesmerised! Beer beer beer! You cant beat The Fest for variety, quantity and service of beer, and thats enough for a 5 star from me! 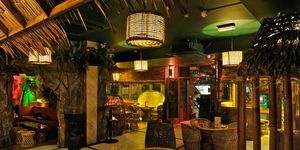 Its always lively, and you wont get an experience like this anywhere else in London, guaranteed! 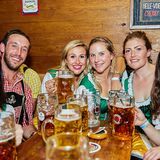 Whether you go to take on the double knuckle challenge, or just to get hammered on international beers served by laides in traditional german dress, you'll definitely have a great time here....unless you have a few too many litres (yes,litres!) of Paulaner that is! If you've always dreamed about hitting Oktoberfest, check out The Fest to whet your appetite! The Fest is awesome. They are the only live music venue in Fulham and their bands rock. Also their big screen for sports is high definition so I watch every football match there. It's like being at the ground. They also do theme nights like Beerfest parties and Toga parties. The Fest is best bar in Fulham, I go there regularly would reccomend it to anybody. We hired the whole restaurant for my dads birthday on Saturday evening.. it was AMAZING!!! the venue was fab Nathan the manager was so accommodating that it made organising a party for 100 people easy! all guests had a choice of 3 main meals and 3 scrumptious puddings!! everyone loved the food and the atmosphere.The German band was brilliant and everyone was on their feet dancing throughout the evening!I would defo recommend going to this restaurant for lunch or evening as its a great night out with friends.. typical tables and long stools to give an oktoberfest atmosphere!I have been 3 times now and each and every time been met with very kind and helpful staff and brilliant people and atmosphere. Went here with a small group of friends and had an amazing time. My boyfriend loved it cause the meals are definitely to German standard and are by no means small portions. Not to mention the steins of GREAT German beer, they also had alot of different bottled beer which I really enjoyed as I like to try different beers. And the band were fantastic, definitely dancing on the seats material, and the drinking games were so funny, I even got involved but didn't win...still got to finish my free boot of beer though - great stuff!! And I even got to practice my German with the staff, they were all really friendly. Thanks for a great night out. I came here for dinner on a Friday night and what a great atmosphere! It was a lot different to the Saturday night Parties they are famous for! The atmosphere was super relaxed and excenuated by the live acoustic music they had on. I was with a group of 5 who have all been to Oktoberfest and needed a pork knuckle fix! The knuckles were awesome! Huge portions and tender, tender meat! All washed down with great beer! The Fest Pub really knows how to celebrate the Beerfest. You get the decoration, the dresses and of course the drinking games. A very relaxed atmosphere, the oompah band and the friendly staff made our night definitely to an unforgettable one. Oktoberfest in London...and it almost felt like being in Munich! Thanks for an amazing time! Definitely my favourite pub. I went to the Oktoberfest in Germany for the 6th time last year and after last Saturday night I can honestly say that this is the closest thing to beerfest I have experienced outside of Munich. The beers were HUGE and the food authentic and in MASSIVE portions. Great atmosphere. The German band was litte loud when we were there but the drinking games were fun and it was really worth the effort! I give it a big thumbs up great fun! this is a crappy place. dont bother. I have been to Oktoberfest in Germany twice and this place was great. We went there to watch the England rugby and they had a live German band after the rugby had finished. It was awesome. We had some great German food and everyone was singing along with the band and dancing on the tables. One of the best nights out I have had in years. Big thumbs up! The worst I've ever been to. Being German myself I was looking for a good night out with some mates. It was a nightmare: Unfriendly staff, horrible food and silly atmosphere. Not German at all. Do not go there. Clear in its intentions and short on subtlety, Octoberfest Pub brings a little slice of Munich's iconic Oktoberfest season to south west London all year round. Enormous beers are paired up with a brass band, while the party atmosphere is apparent from the moment you glimpse the Fulham High Street façade. Designed to emulate a Munich beer hall, this bar features long wooden picnic-style benches and Bavarian-style decor, with Oktoberfest memorabilia and colourful flags on the walls and ceiling. 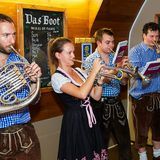 Staff sport dirndl dresses and lederhosen as they dish out beers by the litre from behind a relatively small bar area, considering the size of the tipples it proffers. So, it may not emulate the scale of the famed German festival tents, but it has captured the spirit for sure, and that's before the party even gets started. Predictably, Saturday nights steal the show at Octoberfest Pub; when it’s buzzing this is one of the most rowdy and raucous nights out in the area. Granted, it may not suit everybody's taste, but the beer flows freely and impossibly large steins spill over with froth, while the clientele disregard the rules and leap on the benches to oompah tunes. Local legends Oompah Brass take to the stage with a set-list of chart classics and rock ballads featuring tubas, trombones and other brass lovelies. These are show folk, interacting with the crowd and clearly enjoying the atmosphere and intimacy of the venue, and while maybe it's not entirely responsible, they certainly play a part in getting feet on tables and drinks down the hatch with a string of games and challenges that attract the student crowd. However revellers also include professional 20-somethings and birthday bookings. 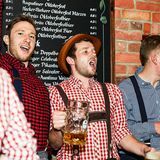 These weekend parties do indeed capture the festival spirit, and there's a sociable, community feel that does indeed resemble that of Munich in Oktoberfest season. That said, when the weeknights roll around, the whole get-up can begin to seem a bit silly. A litre of beer is rather a lot for a Tuesday night, and the festival theme is in danger of slipping into gimmick territory. Still, it's not an unpleasant place to enjoy a beer, even when it's quiet. The team are pleasant and attentive, and the drinks selection is a beer lover's gift that just keeps giving. To match the hearty beer stocks, the food menu offers traditional German cuisine of currywurst, pretzels, meatballs and more. Sizeable main meals generally come in at under £10, while snacks can help sociable drinkers line their stomachs in true Bavarian style. Of course, a food challenge beckons. Diners are called upon to unleash their inner lumberjack and chow down two pork knuckles served with chips and sauerkraut, with a stein of Löwenbräu for good measure. Themes and festivities aside, this little pub truly earns its stripes behind the bar. Huge helpings of lager and weissbeers come imported from Germany, served up from taps or in bottles. A total of around 60 beers are up for the tasting, with big names including Paulaner, Augustiner and Furstenburg. The bar staff can stand up to an interrogation on tastes and preference, offering advice and perfectly pouring pints from £3.50 to £5 and steins from £9 or £10 a pop. Regulars are invited to take on a beer challenge, sampling 55 flavours in the space of six months, while those feeling ambitious can test out a menu of German schnapps too. If beer doesn't appeal, however, there are various wines, spirits and mixers, but it's clear where the speciality lies, and that's where you'll find the variety, too. The success of an evening at Octoberfest Pub fully depends on the entertainment on offer, the crowd in tow and personal preference. But, come Saturday night, it really does become something reminiscent of the great beer halls in Munich. Here, guests can let their hair down, hit the dance floor and enjoy a few decent drinks, in a simply silly and minimum-pressure night on the tiles. 11 destinations curated by Andrew M.